Sounds of choking and gagging reached me as I entered Bette Seever’s shop. She’d set the tarot reading room up for an impromptu dinner. I gawked as her father grasped his throat, writhed on the floor and suddenly lost consciousness. After I’d hurriedly called 9-1-1, rescue personnel soon rushed into the room to take over the scene. Alongside a police officer, I stood and watched paramedics finger sweep his mouth for an obstruction before they bundled Franklin Seever onto a stretcher and rolled him out the door followed by BettyJo. When she’d reached the door, BettyJo glanced over her shoulder. "I’ll be at the hospital. You’ll be right along, won’t you?" I said I would as soon as I locked up for her. BettyJo glanced at the others before she hurried out. I turned to the officer and asked, "What can I do for you, Bailey?" Alan Bailey and I had taken college courses together before I realized I wanted to bake bread for a living. Broad, but fit, Bailey’s brown eyes took in our surroundings without missing a beat. We hadn’t been close friends, but had attended the same parties, gone to the same Providence Bruins hockey games and had even cheered for the same players. "Good to see you, Melina, even if it is under these circumstances. Tell me what happened." His voice was rich, not baritone rich, but even and soothing. A coercing voice that encouraged a person to spill their secrets, so-to-speak. He glanced at the other guests who waited to give their account of the event and then gave me his full attention. "Franklin is BettyJo’s father. She invited him and a few friends for dinner. I’m not sure what happened. I’d run over to my shop for a loaf of focaccia bread and found Franklin choking when I came back." I tipped my head toward the guests and said, "They might be able to tell you more." After he’d made notes, he asked me to stay and beckoned the others forward. "What happened?" Helena Bentwood, owner of The Crafty Cupcake Shop, wrung her hands with worry while Charlie Franklin, an antiques dealer spoke up. "We’d settled at the table, Franklin helped himself to salad and began eating. He’d popped a couple croutons in his mouth and before you know it, he was choking to death. None of us have touched any food," George said. "Can you bag the salad for me, Melina?" Alan asked. "I’d be happy to," I answered and reached for the cabinet to get plastic bags. Assured by Helena Bentwood’s statement that Charlie was right, he let the two of them leave. The only people who remained were Ezra Canter and Corinda Blake. They’d arrived with Franklin close behind. Franklin had introduced them as work associates. Ezra was a banker with nearly the same views and power as Franklin. I figured Corinda had tagged along due to her fascination for BettyJo’s dad. It could have been romantic fascination or maybe she wanted to be counted on the power scale. Her avid interest in the man had been obvious to everyone in attendance. "So you arrived at the same time as Mr. Seever, then?" Alan asked. "Just a few minutes before," Ezra answered. "What are your relationships to Mr. Seever?" Alan asked, giving them each a long look. Ezra cleared his throat and said, "I’m a fellow banker. Franklin and I have been friends since we attended private school together." "I’m in charge of employee relations at Franklin’s banking headquarters in Providence," Corinda replied. Her confident, steady gaze held Alan’s for a moment before she glanced away. Cops don’t look away, they stare you down. I believe it to be part of their training academy curriculum. I hid a smirk at Corinda’s first lesson in her police interrogation experience. I’d been down this road not long ago and knew better than to act mightier-than-thou when faced down by a cop. Confidence is fine, but entitlement pisses them off. A bag of salad awaited the trip to the police lab. If Mr. Seever was dead, God forbid, or he’d had a reaction to something he’d eaten, the lab would make note of it. "You’re sure Mr. Seever only ate the croutons?" Alan insisted. With a nod, Ezra said, "Franklin said he was hungry and helped himself to the salad. He ate a couple croutons and maybe a chunk of tomato." "Who brought the salad?" Alan asked me. "BettyJo put the salad together. I made the croutons for her and left them here earlier today. Other than that, BettyJo did all the cooking, uh, except for the dessert. Helena baked cupcakes for dessert." I thumbed in the direction of her shop up the street. "She owns The Crafty Cupcake Shop." Alan turned to Ezra and Corinda. "That’ll be all for now. I have your information, should I need to reach either of you." Looks of relief flooded their faces. I watched as they gathered their coats and strode out the door in silence. Once they’d reached street level, I noticed Corinda started talking. Ezra grabbed her arm and kept moving toward his BMW parked at the curb across the street. Alan watched them, a serious gleam in his eyes. I figured he considered them persons of interest, but then, maybe we all were. Briefly, Alan glanced around the shop. He muttered, "Look at all those doodads." I chuckled. He smirked and answered his jingling phone. He listened intently for a few moments, glanced at me, and then tucked the phone in the holder attached to his utility belt. With a bland expression, Alan’s eyes always told the story. At least they did when I was around. I always knew when he was about to blow-up, laugh, or any of the other feelings one has. His eyes told me all of it. I was in trouble, big trouble. "Mr. Seever has been poisoned. It seems he would have died if he’d eaten much more. I’ll take that salad along with the croutons, Melina." His face impersonal, his eyes spoke volumes, saying he was sorry to have to tell me this. "Don’t leave town without calling me first. You’re a suspect. Sorry." "Wh-what? You think I poisoned Franklin? I hardly know the man, I have no reason to poison him or anyone, for that matter." I drew in a deep breath, let it out slowly, and tried to gather my wits. Shut-up, Melina, just shut your mouth now. If I was suspect number one, then I’d better keep my own counsel. "I’ll be handing this over to the detective division. You’ll likely hear from them as soon as the poison has been identified." Alan tucked the notebook into his breast pocket and took the bag I offered him before he left. Worry weighed heavily me. The lock clicked as I closed BettyJo’s back door. Racing from the parking lot in my Fiat, I rushed to Rhode Island Hospital’s emergency department. BettyJo probably wondered if I planned to show up. Her eyes huge as saucers, BettyJo paced the floor of the waiting room. She’d been crying, her make-up had smudged in pools under her eyes where she’d wiped it away. I gave her a hug and murmured, "Officer Bailey said your father had been poisoned. Will he be all right?" She nodded and mumbled something that sounded like, "He could have died, and it’s all my fault." "Your fault? Why would it be? You didn’t poison the food, I know you didn’t." I handed her a wad of tissues from my purse. "The police will figure out we argued all the time and they’ll blame me, you know that, don’t you?" BettyJo wiped away her new flow of tears and blew her nose. "Why aren’t you in the cubicle with him? I’m sure he’d want you there." "The nurse said I was to wait here and they’d let me know when Dad was taken to a room. He’s being admitted for observation." BettyJo slumped into a well-used waiting room chair. She rubbed her face, ran her hands through her hair and heaved a sigh. "Will Bailey handle the investigation?" "No, the department will assign a detective to the case." I patted BettyJo’s shoulder. "I’m so glad your father is going to be fine. I’ll be the main suspect, BettyJo, because the croutons came from me." BettyJo adamantly shook her head. "Nope, not happening again. We just went through a murder investigation, we can’t go through an attempted murder. Hell, I’ll lose my mind." "I feel the same way, so let’s get serious and figure out who the hell did this and why. Otherwise, we might be roomies at the big house for bad-asses." She’d opened her mouth to speak when an orderly approached. "Your father is going upstairs now. Would you follow me, please?" the slight man asked. We both rose and walked quickly behind him as he entered the elevator. Soundlessly the doors slid closed and seconds later they reopened. Having advised us to stop at the nurse’s station around the corner to the left, the orderly stepped back into the elevator and wished us well. Corridors stretched out in a couple directions. We scuttled to the way our orderly had pointed and stopped short at the nurse’s station. A dark haired woman with a name badge pinned to her uniform glanced up. "Can I help you?" Nurse Hadley asked. "Could you direct us to Franklin Seever’s room?" BettyJo asked. Checking a roster, Nurse Hadley asked, "And, you are?" "We’re his family," BettyJo said as she motioned to both of us. Nurse Hadley checked her computer and then said "He’s been put in room 14. You won’t stay long, will you? He needs rest." We nodded in unison and skirted the station to get to Franklin’s room. A policeman stood at attention at the door. The single bed in the dismal private room held BettyJo’s father. His pale features were drawn, he lay completely still while monitors beeped and his I.V. dripped. I assumed that I’d look that way or worse if someone had just pumped my stomach. I shivered at the idea. The cop put his hand out to waylay our entry. BettyJo gave him a sharp glare and said, "That’s my father, and I’ll be going in there, so step aside." He asked for identification and told me I wasn’t allowed in. Only family could visit. I nodded, gave BettyJo’s arm a squeeze and said I’d be right here, awaiting her return. Her angry glare directed at the cop, BettyJo said she’d be back directly. I leaned against the wall on the other side of the doorway, the cop took up the other side. He didn’t try passing the time away with idle chitchat, nor did I. Visitors and staff passed by, glanced at me and then at the cop, curiosity on their faces. I didn’t speak or smile, I just waited. Before long, BettyJo joined me and we left. "He’ll be fine. His throat is sore from where they stuck the tube down his throat, other than that, he’s pretty chipper for someone in his circumstances," BettyJo remarked. We walked across the hospital grounds. The car park was jammed with vehicles ranging from jalopies to Mercedes Benz and Lexus SUV’s. My small car nestled among the low end of the money chain, as did BettyJo’s. I’d turned to her when Ezra’s hurried figure caught my eye. He’d scanned the parking lot, and then rushed across a service road, meant for rescues, before he scooted through a private hospital entrance. "How much do you know about Ezra and Corinda?" I asked while we skipped down a flight of stone steps into the parking area. "Corinda’s worked for Dad for years. Ezra’s been around since I was a teenager. He and Dad often go on holidays together. Ezra likes to fish, my father, well, not so much, but he goes anyway. I think it’s his chance to kick back and chill. Why?" "Ezra couldn’t get out of your shop fast enough. When he and Corinda crossed the street, she said something, he grabbed her arm and pushed her toward his car. I thought his actions strange. He could have been stressed over your father’s misfortune, though." I left out that I’d just seen him scurrying into the hospital. "That must be it, Ezra’s upset over Dad." "See you back at the shop?" I asked. She agreed and we parted ways. I drove across the bridge toward India Point and veered toward the row of shops where a group of us lived and worked. Mrs. Peterson, my former landlady, had bequeathed the building and its shops to her daughter. Since her mother had been murdered by that very same daughter, the court had given the building’s operation over to an attorney to handle. The attorney never came around, but left our rent collection up to his secretary. If repairs needed to be done, they were addressed immediately. A sweet change from dealing with Mrs. Peterson. Traffic was next to none in this part of town once office and shop hours had ceased for the day. My bakery, The Hole in the Wall, was next to BettyJo’s shop, with an unrented shop on the corner. The long building filled one side of the block on Wickendon Street, a historical and famous neighborhood. South Main and Benefits Streets led off from our string of shops which brought business both ways. I idled into a parking space behind the row of shops and saw BettyJo drive in and park. She walked toward me, her expression one of worry. I suddenly felt the responsibility of an oncoming investigation settle on my shoulders. It seemed not long ago all of us tenants were faced with this sort of encumbrance. I heaved a hearty sigh and slipped my arm through BettyJo’s. "Let’s get a sandwich from Mack & Mutt’s," I suggested. "I’m famished and had to throw out dinner on orders from Bailey. He took the salad to be analyzed and said I was a suspect. Imagine? I’ve been back from Scotland for a week and we’re already been implicated in poisoning your father? Sheesh!" Her eyes on me, BettyJo missed a step and tripped up the back stairs leading to the row of businesses. I grasped her arm, hauled her upright and exclaimed, "You did realize that implication, didn’t you?" Her slight shrug baffled me. Had she or hadn’t she figured that out? 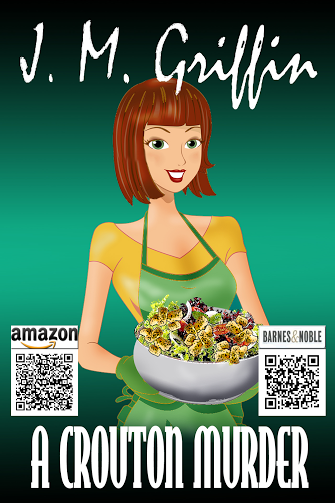 "Just because my father had a reaction to the salad doesn’t mean either of us poisoned him. I had time to think while I waited for you to arrive at the hospital. It occurred to me that we were absent from the room off and on while everyone got seated. Before that, the salad sat on the table and could have been fiddled with while they had wine and chitchatted. I brought dinner down from my apartment and you went for bread which also offered a window of opportunity. Do you think Ezra or Corinda dropped poison in the salad?" It was my turn to shrug. The whole thing didn’t make sense to me. Who was the intended target? Me, BettyJo, or one of the five others? We would all have likely eaten the salad, so which one of us was the killer after? I couldn’t picture George or Helena doing such a thing, but then I’d never have suspected Mrs. Peterson’s killer either. "Good question," I said. "For all we know, any one of us could have been targeted by one of the others. We should look into Corinda and Ezra. Dig up whatever we can find out about them and go from there. Until we have a plan, let’s eat and talk about something less depressing than attempted murder. I think it’s safe to say our fellow renters weren’t part of it, though if we don’t find anything of use on your father’s friends, we’ll have to look at Helena and George." "Sound ideas, both of them. Let’s talk about your trip to Scotland while we eat." We strolled into the pizzeria, where Carl Mack stood behind the counter, his pen poised over an order pad. He grinned and said, "Boy, it’s been really dull around here while you were gone, Melina. Glad you’re back." He grinned and then said to BettyJo, "Sorry to hear about your father. You must have been scared out of your mind." She nodded, ordered a spinach calzone and I ordered a pizza for one. When he’d disappeared into the kitchen, we settled at a corner table which offered a view of both ends of Wickendon Street. I noticed BettyJo glance up and down the street of and on while we waited. I wondered what she was looking for, but didn’t ask. Carl brought our meals over and took a seat opposite us. "How was Scotland, Melina? Did you get married while you were there?" With a snort, I said, "Hardly. Seanmhair was in her glory and didn’t want to leave. I had a good time, loved the hospitality shown us by Aidan and his household staff, but thoughts of getting my business back up and running worried me. Aidan is a great host, his family tree is impressive and the home he lives in is amazing." I picked a slice of pizza off the plate and gobbled it up. "Did Aidan stay in Scotland, or did he return to the states with you?" "He had business at home, so we came back alone. How have you two been doing since Kristina was arrested?" I murmured softly. Carl’s partner, Bill Mutton, had been dating Kristina when she was found to be involved in Mrs. Peterson’s death. "Bill moped around for a while, mostly because he was so shocked over Kristina’s actions. He seems to be perking up. We’ve been real busy, so that’s kept his mind occupied." Carl glanced at BettyJo and remarked, "I hear somebody will soon move into the shop next to yours. Do you know what business it’ll be?" "I don’t know. A few people have looked at it while Melina was away, but no one has signed a lease as yet that I’m aware of. A couple came to check it out today. They were in there with the attorney’s secretary for quite some time." "Too bad to have it empty. It’s not good for a building like ours to have an empty shop. It points to signs of economic stress and shines a poor light on all of our businesses," Carl said. "I was hoping George would encourage one of his friends to rent the store. It’s a corner, so it costs more to rent than in inner shop does." "It’s a perfect place for just about any enterprise," I added and finished off another slice of pizza. We’d nearly finished eating when Detective Porter Anderson strode through the door. He glanced at me, nodded, and then read the overhead menu. Carl left us and took his place behind the counter. After Porter ordered, he came toward us, taking in the shop and us in one sharp look. His gray eyed stare, all serious and nerve wracking, rested on me. I pushed a chair out for him and finished my pizza before his questions caused me to lose my appetite. "Evening, ladies," Porter greeted us softly. 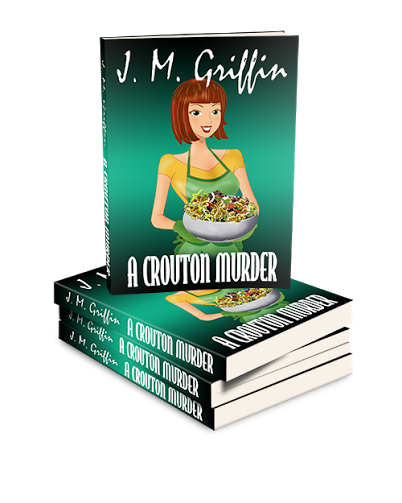 A Crouton Murder by J.M. Griffin is a 2013 Lachesis Publishing release. I was provided a copy of this book in exchange for an honest review. Melina and the gang are back in this Deadly Bakery short story. Melina's friend BettyJo's father is poisoned while eating homemade croutons Melinda had personally made. Now she is suspect number one. If that weren't enough, her relationship with Aiden is up in the air and Melina's grandmother has her heart set on moving to Scotland. This second book in the series sort of picks up where the first book left off. We know BettyJo has issues with her father who is very disappointed that his daughter isn't in the banking business pulling in huge sums of cash. BettyJo and her father argue a lot but that doesn't mean she wanted him dead. But, Melina and BettyJo are not the only suspects. Who else may have wanted to poison BettyJo's pompous father? Melina's feelings toward Aiden are a mystery to me. He seems besotted but she seems rather reserved. A stunning turn of events will have you wishing for that third book in the series to come along Right Now!! A very light, fun cozy mystery that will have you wishing for the smells of homemade baked bread. This one gets 4 stars. THANKS J.M. GRIFFIN FOR JOINING ME AT THE BOOK REVIEW TODAY! As a storyteller, and avid reader, it’s always an honor when somebody asks if I’d read their book and give them an honest opinion. On the down side of that, is the thought that the book might not be to my liking, it might have unresolved issues, and then there’s the fact that we might be friends (or writing acquaintances) and to be fair, the review might need tempering along the way. With that said, I realize my novels may seem to suffer from some of the aforementioned issues, as well, so I try to keep that in mind when giving a review. Cruelty is never part of that honesty, not ever, and I’m happy about that. When reading a stand-alone novel, I can usually rest assured there won’t be any repetition of facts, at least I hope not. What bothers me about series novels is the fact that the author will repeat past happenings (and does so way too often) over and over, filling three or four pages with occurrences that aren’t necessary, and makes me yawn. It’s annoying, and I figure, if a reader’s interest is piqued enough, they’ll buy the rest of the series and do so happily. That’s not to say references to something that happened in a previous book shouldn’t be mentioned, just mention it in passing or that introductions of the main characters aren’t necessary, mainly because if this is the first time a reader has begun the series, they won’t have any idea who is who, etc. Writing, rereading, and editing are part of the process that every author does (at least, I hope so, LOL). We write, rewrite, rear, reread, edit and edit again until we are so tired of the story that we just want to be done with it for a while. That really does happen, no fooling. When we’ve taken a brief respite from the novel writing, editing, and whatever, process, we come back refreshed and with new eyes to look at the story, see what needs fixing or cutting and then have a go at it. All said, it’s fun to be in that mode, and more fun when the editor gets her/his hands on the book and finds little to change or fix. What’s your take on the issue of prior happenings being repeated until you yawn? I’d be interested to know. Thanks for stopping by today!